I've been wanting to research sprouting and try it for myself and I recently found some time to do this. The kids and I tried our hand at sprouting some buckwheat I had in the pantry. I have to tell you that I was pleasantly surprised at how easy it was and the kids thought it was great to watch the seeds turn to sprouts almost right before their eyes. Although it was relatively easy to sprout the buckwheat, I wanted to know what the nutritional value of sprouts is and why one should spend the time preparing sprouts (or purchasing them at the grocery store). I was actually astounded at the nutritional value in these little sprouts. Sprouts are one of the most complete and nutritional of all foods tested. Check out a few of these interesting facts. One sprouted Mung Bean has a carbohydrate content of a melon, vitamin A of a lemon, thiamine of an avocado, riboflavin of a dry apple, niacin of a banana, and ascorbic acid of a loganberry. Wow! The sprouting process creates chlorophyll and chlorophyll has been shown to be effective in overcoming protein deficiency anemia. Sprouts have a regenerating effect on the human body because of their high concentration of RNA, DNA, protein and essential nutrients which can be found only in living cells. The chemical changes that occur in the sprouting seed result in a powerful enzyme activation. Such an infusion of active enzymes can heighten enzyme activity in your metabolism and lead to regeneration of the bloodstream. Some vitamins increase during sprouting by 500%. For example, in wheat, vitamin B-12 quadruples, other B vitamins increase 3 to 12 times, vitamin E triples, and the fiber content increases 3-4 times that of whole wheat bread. Dry seeds, grains, and legumes contain no vitamin C. After sprouting, they contain around 20 milligrams per 3.5 ounces of sprouts. Keep in mind that sprouts are in a pre-digested, enzyme rich state which means that the 20 mg is much easier to absorb than 20 mg in a lifeless vitamin C tablet. You can make growing your own sprouts as simple as soaking a few seeds on a plate on the kitchen counter or as complicated a purchasing growing trays, bags, growing mediums, etc. It really depends on what you want to do and how much time you have. Here are a few tips to get you started. Pick a seed, nut or whole grain to start with. I recommend organic, untreated seeds. Sort through the seeds and discard any dirty or damaged seeds. Place the remainder in a large wide mouth glass jar, cover the top with mesh or thin cloth, seal with a heavy rubber band or ring lid and rinse until clean. Rinse the seeds well and cover with warm water. After 8-12 hours, drain the water and then rinse the seeds well. Cover the jar loosely or set it in a dark, ventilated place such as a cupboard. Seeds must be rinsed and drained daily. Most seeds do well with once a day rinsing, but some like alfalfa must be rinsed twice a day. Soybeans need to be rinsed every three or four hours to prevent their spoiling. After three to four days of germination, leafy sprouts like alfalfa require exposure to indirect sunlight for several hours a day. This greening process allows the chlorophyll to develop in the leaves and increases vitamin C and flavor. Others, when clean and dry and after hulling (when necessary) can be directly refrigerated in a covered jar. Once a seed has reached its nutritional peak, allowing it to mature further will ruin it. Harvest ripe sprouts and continue to sprout unripe ones. Keep your ripe sprouts in the refrigerator, rinse them daily, and use them in about 4 days. Air - keep them in a container that is covered with cloth or screen. Do not keep them in sealed containers. Water - after a good soaking, sprouts need water every 12 hours at least and more if its hot. In your efforts to keep them watered, don't drown them, they must be allowed to freely drain or they will rot. Warmth - sprouts need to be kept warm to germinate and grow. Optimum temperatures vary, but 70-75 degrees is a good start. Don't let them get too hot or they'll wilt, lose vitality and die. Colder temperatures will slow growth and are good for storage, but don't freeze them. Space - for best results, give your sprouts some room. Some sprouts can increase up to 3 times their size. Cramming them in a jar or overfilling a tray will force them to compete for light and air, with inevitable casualties. Spread only a thin layer of seeds in trays, keep them mobile in bags and jars and remember they get bigger. Light - Most sprouts can't use light in the first few days of growth, and many never need it. However, any that produce leaves will eventually need light to 'green up'. Direct sunlight should be avoided unless it's cold, as it can overheat your crop. Most sprouts will be fine if they get indirect natural light, there is no need to keep them dark. Nutrients - adding liquid plant nutrients to the soak water will give the sprouts an extra boost that you will later enjoy. It is not necessary, but will increase their health, longevity and nutritional value. You can also mist the sprouts with a dilute solution after rinsing. Use a few drops of liquid kelp in water, or another organic plant feed. Jars - Use them for sprouts that don't need light, as sprouts in the middle rarely get enough. Avoid overfilling them and don't use a lid. Cover them with cloth and invert the jar to drain. 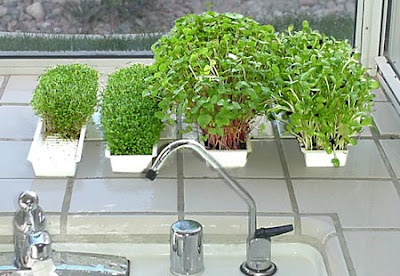 Trays - arguably the best way to grow sprouts especially those that need light. They have a large surface area to soak up more light, can be stacked easily to save space and most importantly, allow the sprouts to grow naturally upwards. Bags - these are best for beans and grains which don't need light. They allow air to the sprouts, are impossible to break, take up less space than jars and are easier to rinse and drain. Just dip and hang. You can even make your own drawstring bag out of any material that allows water and air to move freely but holds the sprouts, the best are hemp or linen as they still breathe when wet and don't dry their contents too quickly. Put pre-soaked seeds into a moistened bag, dip in rinse water for a minute and hang to dry away from drafts. On each subsequent rinsing, move the sprouts around in the bag to stop them from rooting into the fabric. Grains and beans expand by about 3 times from dry, so don't overfill. Hi Evelyn! I'm so glad! !